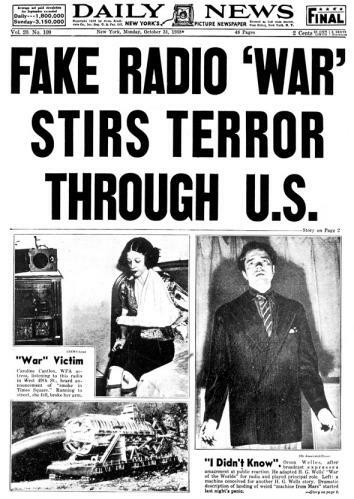 Today marks the 75th anniversary of Orson Welles’ classic radio broadcast of The War of the Worlds. Legend has it that the broadcast launched widespread panic in the U.S., causing some to commit suicide rather than be defeated by supposed aliens. Given the era–the rise of Hitler in Germany and the beginnings of World War II, while still reeling from the effects of Great Depression–it’s not that surprising that people would fall for the idea that we were being invaded by Martians. How afraid they actually were, and how widespread the supposed panic was is a matter for debate. The broadcast is, after all, pretty convincing, especially if you happened to tune in late–after the disclaimer that it was a dramatic production. PBS had an excellent program on last night (which you can watch online here) that explores the broadcast and its effects. If you’ve never heard the original broadcast, you can hear it online in many places, including YouTube and The Internet Archive. It’s a great program and one that you should really listen to without distraction if possible, for the full effect. There is a nice in-depth analysis of the program and its effect here, including mention of a BBC Radio 4 program that cast some suspicion on the claims of widespread panic. BBC Radio 4’s ‘Archive on 4’ series, which last week examined the broadcast’s legacy in ‘Myth or Legend: Orson Welles and The War of The Worlds’ and questioned the extent of the panic, noted that out of an estimated 6 million listeners, around 1.7 million believed the play to be true. Only 1.2 million were said to be “frightened”, according to a study, and just 20 people – a tiny fraction of those who actually heard the show – had to be treated for shock. Could something like this ever happen again? I have no doubt it could. We have a sizable portion of the population that already believes in aliens, ghosts, vampires, the occult, and, of course, zombies. Our is a nation that seems to be proudly and stubbornly anti-science. We’ll fall for anything.